I'm working on migrating our current terminal server (Windows Server 2008 R2) to a new server with Server 2016. I've installed all the roles on the new server and setup my apps. Works perfectly (almost) through RemoteApp Website. However I can't figure out for the life of me how to create an MSI executable of any of my apps I publish on the Server 2016 terminal server. This was so simple in Server 2008 (see below). How can I do this in Server 2016? I was able to create one by logging into my Server 2008 TS REMOTE APP MANAGER and connecting to my Server 2016 Terminal server. It created the MSI but it's dicey and when I install the app on a client the icon is "damaged" and corrupted looking. Is there a better way to make an MSI Executable directly on the Server 2016 terminal server? I plan on decomissioning the old 2008 Server anyway once I have the new Server 2016 up and running. The whole process for managing terminal services in 2016 seems to have taken a step back and become difficult. At this point I kind of regret purchasing the licenses for it. This feature has not been available since Server 2012. It may be inconvenient, but there are other, possibly better ways to accomplish the same functionality. I’ve not found the missing MSI feature to be a roadblock. There is the “RemoteApp and Desktop Connections” feature which is as easy to setup. Not the answer you're looking for? Browse other questions tagged windows-server-2008 windows-server-2016 remote-desktop-services terminal windows-terminal-services or ask your own question. Can I use MSTSC to connect to a Terminal Services RemoteApp? 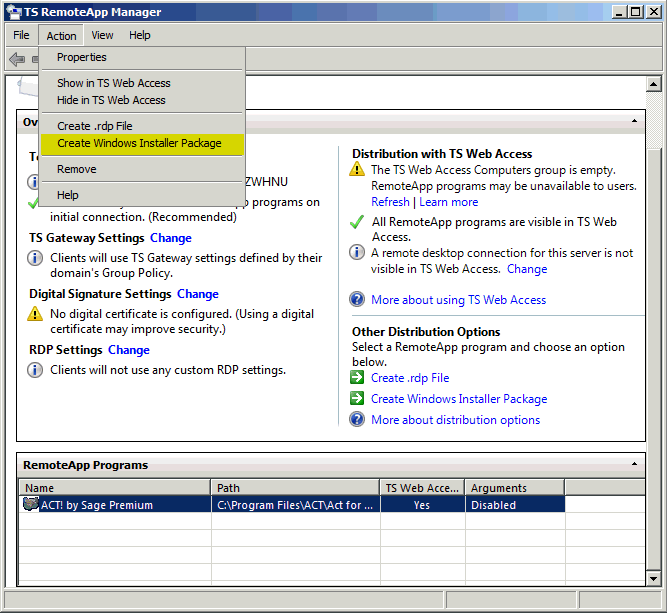 Windows 2008 R2 Terminal Server - RemoteApp - Option “Start in” available? how do I give the client access to remoteapp but prevent ts login?